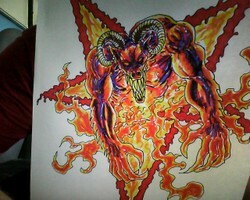 Drawing a Demonic Goat creature rising from the flames of a bloody hellfire pentagram, three videos showing you each stage of drawing, inking and coloring the demon monster. Drawing demonic creatures and stuff from your imagination sure is quite fun, especially as you are relying on imagery that you may have in your head already from seeing others artwork or from previous sketch ideas you've drawn before. In this three part video drawing series hopefully you will become inspired to try and draw your very own demonic creature and it doesn't have to be a Goat demon. The first video is about the pencil sketch stage in which I attempt to sketch the Demon creature with a 5B pencil, now I used a nice soft pencil like this so that it would appear quite clear on the video and plus I converted the video to HD (high definition) format which cuts down on all the bad quality when you try and save it in the lesser file size formats. When it comes to the inking stage, you can pretty much go over all the essential pencil lines, but what you really want to try and do is add more detail and try and change a few lines that didn't work. Also you can introduce different ink line weights to the drawing and really create a stylized piece of art and in this case it looks more like comic book art than anything else. Use inking techniques like cross hatching on certain areas for any shading that you do and don't forget, it's your drawing, so draw yours differently to mine, because that's the whole point really, to draw and find your own artistic voice. For inking I use gel ink pens, Sharpie marker pens and sometimes paint brushes with Indian Ink which is a really dark black for inking which is perfect, but in this case I used a gel ink pen which are really cheap to buy. Coloring in your creature is the fun part especially if you know that there is going to be fire and flame colors to be colored in and in this final video you will see my coloring process which may be slightly different than yours or anyone elses, but again you can color your drawings how you see fit. I used the Crayola Supertip pens in a rather sketchy coloring way which left a lot of the papers white surface there so it would add a nice effect to the flames especially. When coloring in things like flames it's best to color how they should appear, for example when I colored in the flames I drew a few swirls or red and orange within the flame ink lines to give it more movement and that's the thing with adding color it can add a whole new dimension to your drawings or designs. Zentangle is a form of relaxation and an attractive style of art inspired by the subconscious. If you can doodle when you are on the phone, you can do this style of art. How to draw zombies and ideas for rotting zombies by artist Wayne Tully through drawing videos which demonstrate some possible ideas to sketch out.